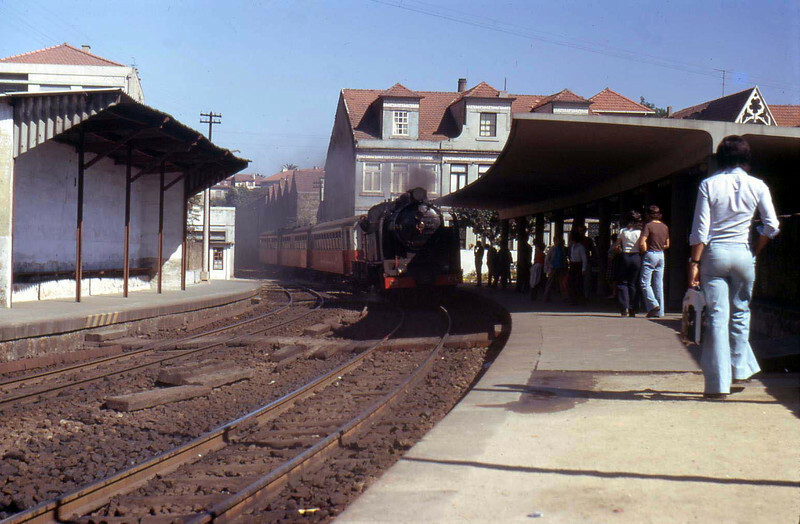 A holiday in Portugal in August 1974 where I discovered the delights of the Porto steam-operated metre gauge system. The narrow gauge lines were steam-operated for much of their existence. Diesel railcars were introduced as an economy measure in the 1940s, notably the Série 9100 built in Sweden for the Tâmega line in 1949 and the Dutch-built Série 9300 railcars used on several other lines from the early 1950s onwards. The Série 9700 diesel multiple units were purchased secondhand from the Yugoslav Railways in 1980, but frequently proved unreliable. Metre gauge diesel locomotives were built to replace steam haulage, especially on freight or mixed trains, notably the Série 9020 built in 1976. Steam remained in use on some lines until the 1980s. Guimarães line: this line (Oporto-Guimarães-Fafe) was built as a metre gauge line. It closed between Guimarães and Fafe in 1986; the trackbed was converted into a cycle way. The rest of the Guimarães line (west of Guimarães to Oporto) was converted to broad Iberian gauge in 2004.